Cello Art at Gallery 55! July is an exciting month for Gallery Fifty-Five. Not only do we have equine art by Liane Kerting-Vick, ceramics by our newest member Candace Bonawitz, a pocket sketching workshop by Kath Macaulay July 10-12, but also cello art (cellos made into art, yes) by Pam McKnight and Stephen Douglas. Come down any time in July to see the cellos or come to the reception on July 7, 4-8 pm. 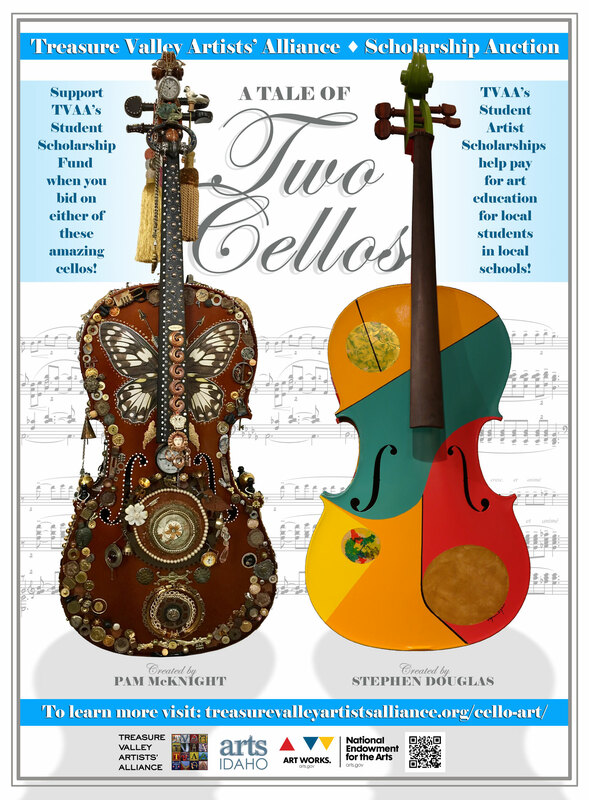 The cellos will be auctioned off in September to benefit the Treasure Valley Artists’ Alliance scholarship fund. Stephen’s cello magically plays music. Both cellos are beautiful. For more information about the auction, see treasurevalleyartistsalliance.org/cello-art/. For more about Kath Macaulay’s workshop and how to register, visit galleryfiftyfive.com/workshops/pocket-sketching-for-fun-and-travel/. Through the magic of the McCall Arts & Humanities Council Cabin Fever Series, we are able to offer you two workshops at the gallery in February, one on metal smithing by Nancy Sathre-Vogel and another in book arts by Thea Belecz. Nancy’s workshops actually bridge January into February. She is offering two evening classes, one in the basics of soldering on January 31 and a second workshop on February 1 on copper patinas. Both classes run 6 – 8:30 pm. Then on Saturday, 1 – 4 pm, February 17, Thea Belecz provides the perfect outlet for your dreams of spring and introduces you to the art of simple bookbinding. Her Garden Journal interleaves gridded and plain paper, making it perfect for storing notes and lists, as well as pasting pictures into one page while plotting and planning on the next page. What a beautiful place to make art with our teaching artists! We’re hosting a number of workshops at our lakeside gallery as part of the McCall Arts & Humanities Council’s Cabin Fever Series. The next one is January 13, taught by Mary Butler. You can register for this workshop at www.mccallarts.org. Don’t delay to ensure your seat. December Reception: Want to shop for unique and beautiful gifts and enjoy a fun event at the same time? Drop by the gallery, at 311 E. Lake Street on December 2, from 4-8:00 p.m. We’ll have Christmas tree decorations, many fine gifts of art, wine by Bistro 45, appetizers, and piano music by Mike Rutledge. We have two fabulous guest artists this month, equestrian sculptor Lynn Fraley and ceramic artist Katharina Roth. Boise artist Lynn Fraley’s equine sculptures exude vivid personalities. Her deep respect for anatomy and biomechanics is evident in each piece. In recent years she has consistently garnered top honors at the annual American Academy of Equine Art Fall Juried Exhibit; the Sam Savitt Award for best depiction of the Horse in Movement in 2017, the Marilyn Newmark Memorial Award for sculpture in 2016 and the Leonard J Meiselman medal for sculpture in 2011. Limited editions are available in bronze, resin or ceramic. For more information, see lynnafraley.com or email her at lynn@lynnafraley.com. Katharina Roth was born and raised in Switzerland, where she studied art history at the university of Basel. In 1992, she moved to the United States. In the U.S. she learned jewelry making and metal smithing and worked for several years in that field before receiving a BFA from Northern Arizona University with a focus on ceramics, sculpture and printmaking. Then, in the fall of 2016, she spent six weeks in a residency program in Jingdezhen, China’s porcelain capitol for over 2000 years, learning techniques unique to Chinese ceramics. 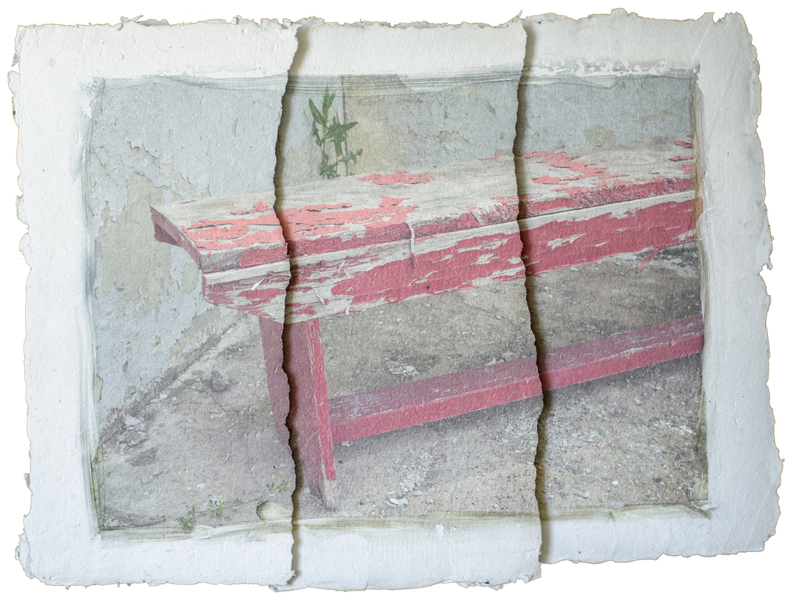 This experience changed the way she worked, moving her from using white unglazed porcelain to applying many layers of slips, oxides, glazes, decals, and luster. Katharina enjoys working out of her studios in Sedona, Arizona, and McCall. Art on the Lake: Come sun, snow or rain, we’ll celebrate art on Saturday, November 4, from 4-8:00 p.m. at the gallery, 311 E. Lake Street. We’ll have art, wine by Bistro 45, piano music by Mike Rutledge, and appetizers. We are pleased to welcome our guest artist for the month of November, renowned landscape painter and art educator Jim Blankenship. Jim says he just had to paint this scene, a grounded C-47, which is being restored by Scotty Anderson near the corner of Mission and Scott Streets in McCall. Jim talked to Scott and found out he is a retired smokejumper who had jumped out of this very plane before it was decommissioned. Scott is planning on building a Fine Arts Center with the plane as a centerpiece for the center. Here Jim is pictured with his canine companion Ralphie, who accompanies Jim in morning treks in the foothills of Boise and the mountains of McCall. This year Jim published a beautiful book of his paintings, assisted by his wife, writer Colleen Blankenship, who he says is his best critic. We will have a copy of his book at the gallery. This workshop has been cancelled. Thank you for your interest! Noreen Shanafelt, a specialist in batik textile design, invites you to play with batik and enjoy the surprising results. You will use natural organic objects and simple techniques to create fabric art that you can frame, wear or use to decorate your home. When: September 27-28, 1-4 p.m. This workshop is suitable for adult artists of all levels of ability and experience. To Register: Class size is limited and pre-registration is required. To reserve your seat, please email us by clicking here.